HugS is an American smasher and is considered one of the best Melee Samus players in the world (along with Plup and Duck). He has been active in the Melee scene since 2004, using a strong work ethic to make his way to the top. HugS takes the competitive Melee scene very seriously, employing a smart style to surprise opponents. 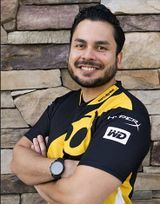 He is currently ranked 5th on the SoCal Melee Power Rankings and 23rd on the 2018 MPGR. He was also invited to participate in the E3 2014-held Super Smash Bros. Invitational tournament to play Super Smash Bros. for Wii U, where he used Mega Man. HugS is widely considered to be the most iconic Melee Samus main, and also played Brawl competitively for a brief two years where he mained R.O.B. for the entire duration. HugS was a significant contender in the MLG 2006 Pro Circuit; he placed in top 8 at MLG Anaheim 2006 and MLG Orlando 2006, upsetting PC Chris early in losers' bracket at the latter tournament. At MLG New York Playoffs 2006, he placed 8th, successfully qualifying for the MLG 2006 singles championships. He eventually placed 8th at MLG Las Vegas 2006, losing to Ken and then to Mew2King. One year later, he placed 2nd at EVO World 2007, narrowly losing to Ken in grand finals. He was picked up by Frequency Gaming on July 3rd, 2014 until their dissolution on February 14th, 2015. On June 2nd, 2016 he was signed to Dream Team. He left the team on December 1st, soon after other members of Dream Team left amid allegations of mispayment. .
On December 14th, 2016, he joined Lucky as a member of Selfless Gaming. He left the team on July 7th, 2017. He was signed with Team Dignitas on January 12th, 2018. SCSA West Coast Circuit #1 December 6th, 2008 9th ? ? HugS credits his proficiency in the Yoshi matchup to his brother, Gabe. The community often jokes around with the phrase "Nice Shot Hugo", as at times, he will either miss his target or fire completely in the other direction. He is also on the receiving end of another meme, as whenever Chudat beats him at a major tourney, Chudat posts the phrase "I whoopedu hugs86" on his twitter with a girl at the tourney. ↑ HugS leaves Dream Team. ↑ Selfless Gaming signs Lucky and HugS. ↑ HugS leaves Selfless Gaming. ↑ Team Dignitas picks up HugS. This page was last edited on April 20, 2019, at 05:50.